These survey findings suggest that the structure of social networking site users’ social networks is as good as or better than most people’s in terms of size and diversity. However, does this make them better people or better citizens, or does the use of SNS cut people off from their physical communities? Are they less supportive? Less trusting? Are they isolated in inward looking silos, unable to explore multiple opinions and points of view? Or, are SNS users as or more engaged with their communities, voluntary associations, and politics? The survey set out to probe these issues, too. Are social networking site users more trusting of others? To get a measure of how much trust people have in their fellow citizens, we asked people: “Generally speaking, would you say that most people can be trusted or that you can’t be too careful in dealing with people?” 41% of Americans said that most people can be trusted. This is much higher than the 32% of Americans who said that most people can be trusted, the last time Pew Internet asked this question in 2009. There is a strong relationship between those demographic factors associated with not having access to the internet and social trust. Specifically, those with fewer years of formal education and those who are of a race other than White or Caucasian tend be less trusting of people in general (see Appendix C, Table C4, for the results of our regression analysis). However, even when we control for demographic factors, we find that internet users are significantly more likely to trust most people. Controlling for demographic factors, internet users are more than twice as likely (2.14x) to think that most people can be trusted. 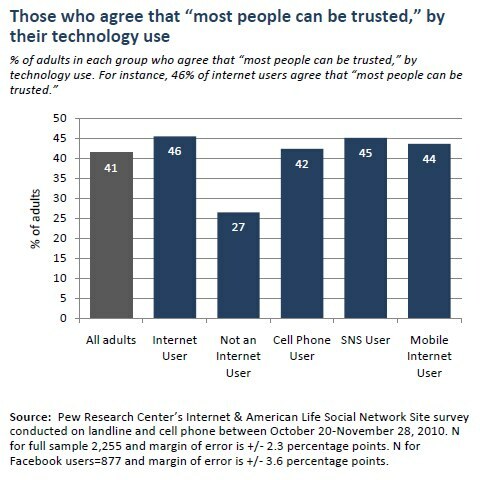 Facebook users are more trusting than other people. What is the relationship between social networking site use and the ability to consider multiple points of view? We are interested in understanding the relationships between the use of SNS and the ability to explore multiple points of view. Specifically, we measured what psychologists call “perspective taking,” which is one dimension of what is referred to as “empathy.” Perspective taking is the ability to adopt the viewpoint of another person, or to consider “both sides of an issue.” The ability to take another person’s point of view is also associated with pro-social behaviors directed at improving other people’s welfare. The survey asked people seven different questions that measure perspective taking and combined their answers into a scale that ranges from 0 to 100. MySpace users have a greater propensity to take multiple viewpoints. The average American scored 64 out of 100 on the perspective-taking scale. There was not a statistical difference between internet and non-internet users (see Appendix B, Table B6, for a detailed table). However, once we control for demographic characteristics that are also likely to predict perspective taking (such as age and education), we found a relationship between perspective taking and the use of specific SNS platforms (see Appendix C, Table C5, for the results of our regression analysis). Controlling for demographic characteristics and other types of technology use, MySpace users tend to have a greater ability to consider multiple sides of an issue in comparison to other people. For example, a MySpace user who visits the site about 6 times per month tends to score 8 points higher on the perspective taking scale. The magnitude of the relationship between MySpace use and perspective taking is very high in comparison to other predictors of perspective taking. For example, women tend to score 5 points higher than men, and people with a 4-year university degree tend to score 2 points higher than those with a high-school diploma. Facebook, LinkedIn and Twitter users are no more or less able to consider alternative points. However, here is a negative, but significant relationship between the use of SNS services other than MySpace, Facebook, LinkedIn and Twitter and perspective taking. Someone who averages 6 monthly visits to an alternative SNS platform averages about one half point lower on the perspective-taking scale. Internet users get more support from their social ties and Facebook users get the most support. People receive a wide range of support from their social networks. This includes emotional support; such as offering advice, information, and understanding; companionship; such as having people available to spend time with; and instrumental or tangible support, such as having someone to help you if you are sick in bed. This survey asked people 15 questions from the MOS Social Support Scale to measure their perception about how much of different types of support they have available. These 15 questions were used to construct a scale that ranges from 0 to 100 for total support, and sub-scales that also range from 0-100 for emotional support, companionship, and instrumental aid. The average American scored 75/100 on our scale of total support, 75/100 on emotional support, 76/100 in companionship, and 75/100 in instrumental support. However, the average internet user reports that he/she has more support than the average non-internet users (see Appendix B, Table B7, for a detailed table). When we control for demographic characteristics and technology use, the relationship between internet use and most types of social support remains significant (see Appendix C, Table C6, for the results of our regression analysis). Controlling for demographics, the average internet user scores 3 points higher on our scale of total social support, 6 points higher in companionship, and 4 points higher in instrumental support. Compared with other internet users, Facebook users report significantly higher levels of social support. On average, a Facebook user who uses the site multiple times per day scores 5 points higher in total social support than other internet users (8 points higher than non-internet users), 5 points higher in emotional support than either internet or non-internet users, and 5 points higher in companionship than other internet users (11 higher than non-internet users). They do not report any more or less access to instrumental support than other internet users. We also found that those internet users who maintain a blog report significantly higher levels of total support (3 points) and companionship (4 points) than other internet users. To put the finding that Facebook users get more support into perspective, someone who uses Facebook multiple times per day gets about half the boost in total support that someone receives from being married or living with a partner. Neighboring in America is up. But are social networking site users less engaged with their local community? In this survey, we asked Americans if they know all, most, or some of their neighbors by name. The last time we asked this question, in 2008, a full 31% of Americans reported that they did not know any of their neighbors by name . In 2010 when we asked people if they knew the names of their neighbors, a substantially larger number reported that that they knew at least some: Only 18% of Americans do not know the name of at least some of their neighbors. What explains this trend? As with our finding that there has been a short-term increase in trust, caution should be taken in interpreting these findings. Measures of trust, neighboring and civics often experience short-term gains and losses in response to economic, political, and social events. It might be that the persistence of the poor economic conditions of the American economy has prompted – or necessitated — that people to turn to their neighbors for informal support. It would be premature to suggest that this current trend is part of a gradual increase in social capital in America. As in 2008, we expected to find that many of those who reported no connections to their neighbors are disconnected because of their stage in the life cycle and not because they are socially isolated. For example, young adults who have yet to put down roots in a community are less likely to know their neighbors. When we control for demographic characteristics, we find much the same as we did in 2008– younger people, apartment dwellers, and those who are neither married nor cohabitating are typically at a stage in their lives when neighbors are less important than other types of relationships . When we control for demographic characteristics, we find no indication that different types of technology use predict neighboring. Internet and non-internet users are equally as likely as others to know at least some of their neighbors (see Appendix C, Table C7, for the results of our regression analysis). This is a departure from our findings in 2008 when we found that SNS users were less likely to know the names of their neighbors. Americans are more civically engaged than they were two years ago. But are social networking site users more civically engaged? We found that 74% of Americans belong to at least one local group. This is significantly higher than the 65% of Americans that belonged to at least one voluntary group in 2008. What explains this trend? Again, it seems likely that the current economic conditions at least in part explain the higher rates of volunteering. People may be reorganizing their time to participate in more voluntary activities. MySpace users are marginally less likely to belong to a voluntary group. Education levels and age explain much of the individual variation in people’s likelihood of belonging to a voluntary group. The higher a person’s education level, and the older he/she is, the more voluntary group he/she belongs. We also explored the possibility that SNS use might be associated with voluntary participation. The only type of internet use that is tied to the number of voluntary group is use of MySpace (see Appendix C, Table C8, for the results of our regression analysis). 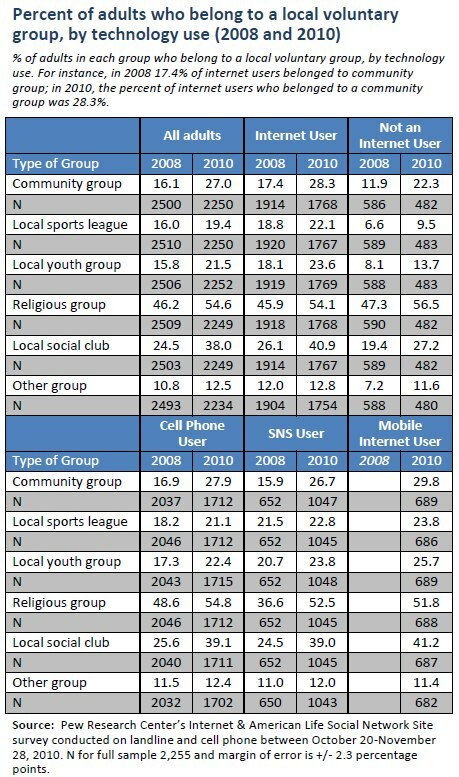 Use of all other SNS platforms does not predict belonging to a voluntary group. However, the relationship is not substantive. Controlling for other factors, MySpace users belong to marginally fewer voluntary group. For example, a MySpace user who visits the site an average of 6 times per month belongs to .024 fewer voluntary groups. Are social networking site users more politically engaged? 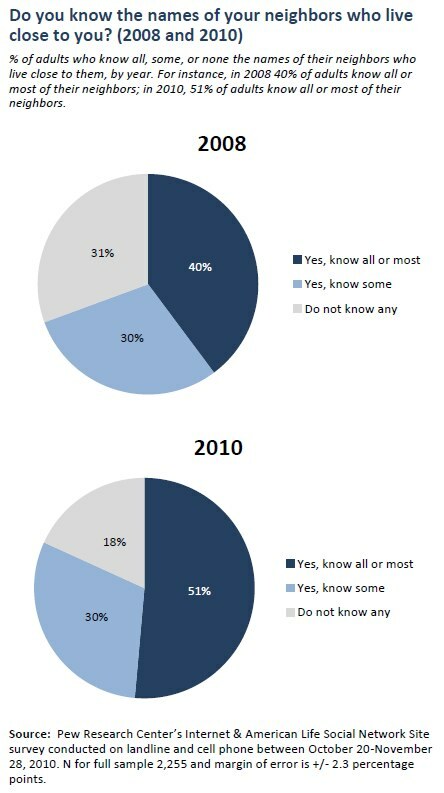 This survey was conducted during the November 2010 mid-term elections. We asked people if they had “gone to any political meetings, rallies, speeches, or fundraisers in support of a particular candidate,” if they “tried to convince someone to vote for a political party or candidate,” and if they had or planned to vote in the November election. 10% of Americans reported that they had attended a political rally. 23% reported that they tried to convince someone to vote for a specific candidate. 66% reported that they intended to or had voted in the election (note: this is much higher than the 41% of American who were eligible to vote who actually did vote. This is a common post-election poll finding. ). Facebook users are more politically engaged. There is considerable variation in the likelihood that a person attended a rally, tried to persuade someone to vote, or intended to vote depending on their use of different SNS platforms. Users of LinkedIn are much more likely to be politically engaged than users of other SNS. 14% of LinkedIn users attended a political rally, 36% tried to persuade someone to vote, and 79% reported that they did or intended to vote. 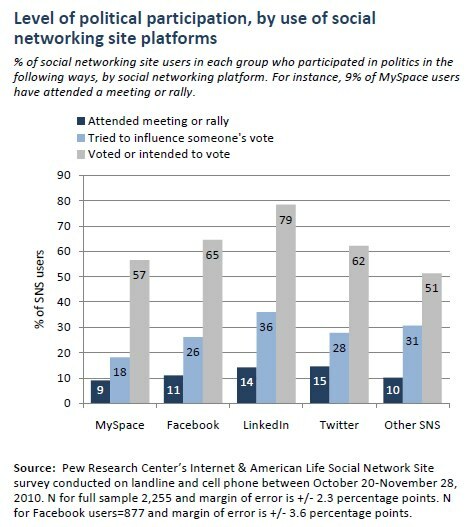 MySpace users are the least politically active. Only 9% attended a political rally, 18% attempted to influence someone’s vote, and 57% voted or intended to vote. However, education and gender are highly predictive of the likelihood of a person being politically engaged. Older and more educated Americans are more likely to be politically involved. Since LinkedIn users tend to be older and more educated, and MySpace users tend to be younger and less educated, this explains most of the difference we observed between SNS platforms. Yet, even when we control for demographic characteristics we found that internet users and Facebook users in particular, were more likely to be politically involved than similar Americans (see Appendix C, Table C9, for the results of our regression analysis). Controlling for demographic characteristics, internet users are nearly two and a half times more likely to have attended a political rally (2.39x), 78% more likely to have attempted to influence someone’s vote, and 53% more likely to have reported voting or intending to vote than non-internet users. Controlling for demographics and other types of internet use, compared with other internet users a Facebook user who visits the site multiple times per day is two and a half times more likely to have attended a political rally or meeting, 57% more likely to have tried to convince someone to vote for a specific candidate, and 43% more likely to have said they voted or intended to vote (compared with non-internet users: 5.89 times more likely to have attended a meeting, 2.79 times more likely to talk to someone about their vote, and 2.19 times more likely to report voting).